The Art of Computer Programming (TAOCP) is a comprehensive monograph written by Donald Knuth that covers many kinds of programming algorithms and their analysis. Knuth began the project, originally conceived as a single book with twelve chapters, in 1962. The first three volumes of what was then expected to be a seven-volume set were published in 1968, 1969, and 1973. The first published installment of Volume 4 appeared in paperback as Fascicle 2 in 2005. The hardback Volume 4A, combining Volume 4, Fascicles 0–4, was published in 2011. Volume 4, Fascicle 6 ("Satisfiability") was released in December 2015; Volume 4, Fascicle 5 ("Mathematical Preliminaries Redux; Backtracking; Dancing Links") is planned for release in September 2019. Fascicles 5 and 6 are expected to comprise the first two-thirds of Volume 4B, which is scheduled to be published on May 17, 2019. After winning a Westinghouse Talent Search scholarship, Knuth enrolled at the Case Institute of Technology (now Case Western Reserve University), where his performance was so outstanding that the faculty voted to award him a master of science upon his completion of the baccalaureate degree. During his summer vacations, Knuth was hired by the Burroughs Corporation to write compilers, earning more in his summer months than full professors did for an entire year. Such exploits made Knuth a topic of discussion among the mathematics department, which included Richard S. Varga. Knuth started to write a book about compiler design in 1962, and soon realized that the scope of the book needed to be much larger. In June 1965, Knuth finished the first draft of what was originally planned to be a single volume of twelve chapters. His hand-written first-draft manuscript (completed in 1966) was 7003300000000000000♠3000 pages long: he had assumed that about five hand-written pages would translate into one printed page, but his publisher said instead that about ​1 1⁄2 hand-written pages translated to one printed page. This meant the book would be approximately 7003200000000000000♠2000 pages in length. The publisher was nervous about accepting such a project from a graduate student. At this point, Knuth received support from Richard S. Varga, who was the scientific adviser to the publisher. Varga was visiting Olga Taussky-Todd and John Todd at Caltech. With Varga's enthusiastic endorsement, the publisher accepted Knuth's expanded plans. In its expanded version, the book would be published in seven volumes, each with just one or two chapters. Due to the growth in the material, the plan for Volume 4 has since expanded to include Volumes 4A, 4B, 4C, 4D, and possibly more. In 1976, Knuth prepared a second edition of Volume 2, requiring it to be typeset again, but the style of type used in the first edition (called hot type) was no longer available. In 1977, he decided to spend some time creating something more suitable. Eight years later, he returned with TEX, which is currently used for all volumes. The offer of a so-called Knuth reward check worth "one hexadecimal dollar" (100HEX base 16 cents, in decimal, is $2.56) for any errors found, and the correction of these errors in subsequent printings, has contributed to the highly polished and still-authoritative nature of the work, long after its first publication. Another characteristic of the volumes is the variation in the difficulty of the exercises. The level of difficulty ranges from "warm-up" exercises to unsolved research problems. All examples in the books use a language called "MIX assembly language", which runs on the hypothetical MIX computer. Currently, the MIX computer is being replaced by the MMIX computer, which is a RISC version. Software such as GNU MDK exists to provide emulation of the MIX architecture. Knuth considers the use of assembly language necessary for the speed and memory usage of algorithms to be judged. Knuth was awarded the 1974 Turing Award "for his major contributions to the analysis of algorithms […], and in particular for his contributions to the 'art of computer programming' through his well-known books in a continuous series by this title." American Scientist has included this work among "100 or so Books that shaped a Century of Science", referring to the twentieth century, and within the computer science community it is regarded as the first and still the best comprehensive treatment of its subject. Covers of the third edition of Volume 1 quote Bill Gates as saying, "If you think you're a really good programmer… read (Knuth's) Art of Computer Programming… You should definitely send me a résumé if you can read the whole thing." The New York Times referred to it as "the profession's defining treatise". 3.5. What Is a Random Sequence? 4.3.3. How Fast Can We Multiply? These volumes were superseded by newer editions and are in order by date. Volume 1: Fundamental Algorithms. First edition, 1968, xxi+634pp, ISBN 0-201-03801-3. Volume 2: Seminumerical Algorithms. First edition, 1969, xi+624pp, ISBN 0-201-03802-1. Volume 3: Sorting and Searching. First edition, 1973, xi+723pp+foldout, ISBN 0-201-03803-X. Errata: . Volume 1: Fundamental Algorithms. Second edition, 1973, xxi+634pp, ISBN 0-201-03809-9. Errata: . Volume 2: Seminumerical Algorithms. Second edition, 1981, xiii+ 688pp, ISBN 0-201-03822-6. Errata: . Volume 4's fascicles 0–4 were revised and published as Volume 4A. Volume 4, Fascicle 0: Introduction to Combinatorial Algorithms and Boolean Functions. (Addison-Wesley Professional, 2008-04-28) vi+240pp, ISBN 0-321-53496-4. Errata:  (2011-01-01). Volume 4, Fascicle 1: Bitwise Tricks & Techniques; Binary Decision Diagrams. (Addison-Wesley Professional, 2009-03-27) viii+260pp, ISBN 0-321-58050-8. Errata:  (2011-01-01). Volume 4, Fascicle 2: Generating All Tuples and Permutations. (Addison-Wesley, 2005-02-14) v+127pp, ISBN 0-201-85393-0. Errata:  (2011-01-01). Volume 4, Fascicle 3: Generating All Combinations and Partitions. (Addison-Wesley, 2005-07-26) vi+150pp, ISBN 0-201-85394-9. Errata:  (2011-01-01). Volume 4, Fascicle 4: Generating All Trees; History of Combinatorial Generation. (Addison-Wesley, 2006-02-06) vi+120pp, ISBN 0-321-33570-8. Errata:  (2011-01-01). Volume 4's pre-fascicle 6A was revised and published as fascicle 6. ^ The dedication was worded slightly differently in the first edition. ^ Frana, Philip L. (2001-11-08). "An Interview with Donald E. Knuth". hdl:11299/107413. ^ Albers, Donald J. (2008). 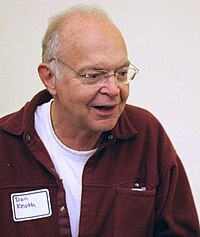 "Donald Knuth". In Albers, Donald J.; Alexanderson, Gerald L. (eds.). Mathematical People: Profiles and Interviews (2 ed.). A K Peters. ISBN 1-56881-340-6. ^ "Donald E. Knuth – A. M. Turing Award Winner". AM Turing. Retrieved 2017-01-25. ^ Morrison, Philip; Morrison, Phylis (November–December 1999). "100 or so Books that shaped a Century of Science". American Scientist. Sigma Xi, The Scientific Research Society. 87 (6). Archived from the original on 2008-08-20. Retrieved 2008-01-11. ^ Weinberger, Matt. "Bill Gates once said 'definitely send me a résumé' if you finish this fiendishly difficult book". Business Insider. Retrieved 2016-06-13. ^ Lohr, Steve (2001-12-17). "Frances E. Holberton, 84, Early Computer Programmer". The New York Times. Retrieved 2010-05-17. ^ "TAOCP – Future plans". ^ a b Wells, Mark B. (1973). "Review: The Art of Computer Programming, Volume 1. Fundamental Algorithms and Volume 2. Seminumerical Algorithms by Donald E. Knuth" (PDF). Bulletin of the American Mathematical Society. 79 (3): 501–509. doi:10.1090/s0002-9904-1973-13173-8. Slater, Robert (1987). Portraits in Silicon. MIT Press. ISBN 0-262-19262-4. Shasha, Dennis; Lazere, Cathy (1995). Out of Their Minds: The Lives and Discoveries of 15 Great Computer Scientists. Copernicus. ISBN 0-387-97992-1.